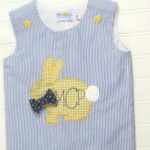 Our bow tie outfits for baby boys are guaranteed to inspire swooning! Find snap on and off interchangeable bow ties and matching cardigans. Perfect for a special day, but comfortable enough for every day!